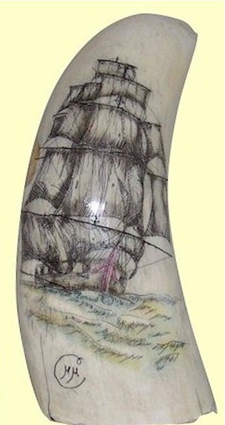 This is a guaranteed real Sperm Whale tooth registered with the Department of Commerce as tooth number 21-0083. It weighs 161.2 grams. This is a Sperm Whale's tooth signed by M.M. Cohen. It's polished on one side so that the viewer can feel the back side and appreciate what the tooth surface was like in its natural state. This well-shaped tooth is 5 inches long, with a 1 3/4 inch base. Carefully etched on the front surface in a light color wash is an American clipper with its stunsails set. American clippers were among the most graceful of our commersial sail. These ships were driven so hard that they lasted for only about a decade of service. This great tooth is sold without a stand. A great tooth that will enhance any collection! A unique piece - Of course, only one is available and it comes with its own Registration Certificate!